Today is Quiet Tuesday. Create a wall of silence around you and put your mind at ease. Noise cancelling headphones can be a good thing. Turn down your distractions and help to calm your inner soul. Once achieved, relax with your favorite craft beer. Not a bad way to spend part of your Tuesday. Here's what's happening around the Colorado beerosphere today Tuesday, January 22nd, 2013. Kokopelli Beer Co (Westminster) - Progress is being made on getting this new brewery operational. Next week they are anticipating the shipment of a lot of new equipment including five 10bbl fermentors and six 10bbl bright tanks. Cannonball Creek Brewing (Golden) - Opening weekend was huge! So big in fact that they are having to close down today and tomorrow to build their beer inventory back up. Cannonball Creek opened to a massive crowd and nearly drained most of their 4 beers they had on tap for opening day. Read some great articles about their opening here and here. Strange Brewing (Denver) - Thanks to everyone's efforts, the Strange Days benefit to be held this Sunday, January 27th at the Rackhouse Pub is now SOLD OUT! Dozens of breweries will be donating beer and a lot of money will be raised to support the legal defense effort for Strange Brewing Company to save their name. Wish them well in their legal battle ahead. Großen Bart Brewery (Boulder area) - It's got a funny sounding name, it involves guys with "Big Beards" and it's coming later this year to Colorado. Großen Bart Brewery, the "ß" is pronounced "ss" is the brainchild of Chad Jorgensen, Shad Chancey and Taylor Wise. Check them out on Facebook or the web and follow their progress towards becoming a unique Colorado brewpub. No location has been listed yet but the three owners live around the Boulder / Longmont area. Boulder Beer Co (Boulder) - Collaborations are becoming more popular these days. Boulder Beer Company and Knee Deep Brewing of California are getting together to produce Shakenbake Rye IPA, a collaboration that will be released in early February. Read all about it in today's press release. Look for it here in Colorado at their taproom on February 8th. Fate Brewing Company (Boulder) - In the continuing stream of brewery openings this month, Fate Brewing Company is planning to open their doors this Sunday, January 27th in Boulder. Those of you who were at the Big Beers Festival in Vail know that Fate has already come up with some great tasting beers. Stop by and welcome them this Sunday at 1600 38th Street, Suite 100 in Boulder, CO. Regular business hours will be posted shortly after the opening. BRU Handbuilt Ales (Boulder) - BRU announces the addition of their latest beer to their lineup - introducing Beezel, a Belgian style golden ale makde with honey, black pepper, and bitter orange peel. Described as "crisp, effervescent, and with a touch of spice". Available now at stores around Boulder. Stay tuned for some of their upcoming beers including: BRU Loch Wee Heavy Scotch Ale, BRU Sasquash Roasted Pumpkin Porter, and BRU Belux Belgian Pale Ale. Debuting in the weeks to come. Wiley Roots Brewing Company (Greeley) - At long last, their Federal application for a Brewer's Notice has been submitted and they are potentially 95+ days away from starting to brew beer at the old Crabtree location. Wiley Roots Brewing will soon join the growing ranks of breweries in Greeley. Summer can't come soon enough. Echo Brewing Company (Frederick) - Today, their Echo English pale (ESB) is back on tap for all you fans. Stop by tonight for Trivia that starts at 7:00pm and runs til 9:00pm. The Orange Crunch food truck will also be on hand to satisfy your noms. Pikes Peak Brewing (Monument) - This Saturday, January 26th from 7pm til close will be PPBC's first ever Black and White Ball. Join in and dance the night away along with Mark's Midnight Carnival Show and all things black and white. Everyone is encouraged to wear outfits that are totally black & white - your originality will be rewarded! Plenty of food and drink available and lots of fun will ensue. No cover charge either! Trinity Brewing (Colorado Springs) - Trinity Brewing is known for doing things their own way and not always according to guidelines. Case in point - check out the latest label for one of their upcoming brews. 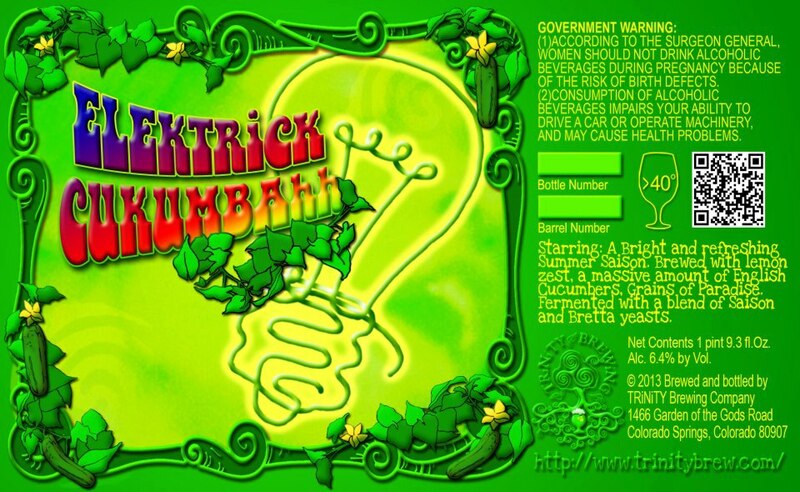 Elektrick Cukumbahh is a Summer Saison that is brewed with lemon zest, grains of paradise, a blend of Saison and Bretta yeasts and a massive amount of English Cucumbers! The 2013 portfolio just got more interesting. Eddyline Brewing Company (Buena Vista) - 2012 was a great year for Eddyline as they produced 1427 barrels of beer. That's up from 2011 where they produced 594 barrels. That's a 140% increase in production! Just wait to see what 2013 brings. Eddyline is a great stopover on your way up to or back from Monarch Mountain. Palisade Brewing Company (Palisade) - It's coming back! Palisade announces they will return to the taps with one of their popular beers - Off Belay IPA - coming in about 3-4 weeks. It was last brewed 18 months ago when it had to be replaced with Hoptocopter IPA as shortages on Simcoe and Chinook hops were happening. Now that the shortage is subsided, they are brewing it once again. Hurry up February! Cruzin Cooler of Colorado (Windsor) - Cruzin Coolers of Colorado is the #1 authorized Cruzin Coolers dealer in the world. Our Cruzin Coolers are perfect for hunting, tailgating, races, camping, golf, business events, trade shows and more! Their electric motorized coolers are super fast, fun and draw a lot of attention! Get yours today. www.crizincoolersofcolorado.com. Cicerone Exams (Denver) - The Cicerone Certification Program has planned to hold exams in the Denver area during the week of the 2013 Great American Beer Festival. Exams will be held on Tuesday, October 8th and again on Friday October 11th at the Metropolitan State University of Denver. More info at cicerone.org. Parry's Pizza (Highlands Ranch & Castle Rock) - Don't forget! This Saturday at both their Highlands Ranch and Castle Rock locations, Parry's Pizza will be hosting a Dry Dock Brewing Tap Takeover from 11am til close. Raffles will be held throughout the day for merchandise, gift cards to the brewery and some other miscellaneous items. Brewery reps will be around to talk to those in attendance about their award-winning beers. What to expect on tap: Paragon Apricot Blonde, U-Boat Hefeweizen, HMS Victory Amber, Hop Abomination, Sugar Daddy Brown, Honey Badger Blonde and two other rare beers that have yet to be announced. Ale Yeah! Hops & Pie (Denver) - Looking for something great on tap? How about these new tappings today: Supplication from Russian River, Smoking Wood from The Bruery, Apis from Elevation & Burton Baton from Dogfish Head. Oh ya, be sure to pair that with a pizza. Tony's Bar (Ft. Collins) - Tony's will be hosting Brewery Night featuring the beers of Grimm Brothers Brewhouse tomorrow night, Wednesday January 23rd starting at 7pm. You'll get to try a flight of 4 different Grimm Brothers beers as well as $1 drafts. Located at: 224 S. College Avenue in FoCo. Under The Sun Eatery & Taphouse (Boulder) - Mountain Sun's latest eatery creation, located directly underneath Southern Sun in Boulder will be open Wednesday through Saturday. They'll have 21 Mountain Sun beers on tap along with 10 guest taps and not to mention some of the best food in Boulder. They're ramping to up be open 7 days a week very soon!